There is a lot of running “gear” out there, some are more necessary than others. 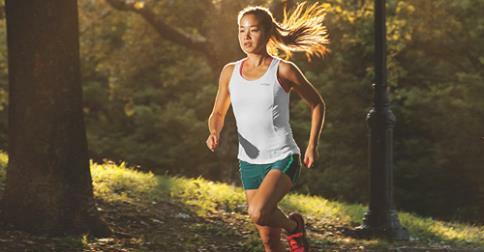 If you had to pick THREE items to tell every new runner that they NEED what would it be? Garmin hrm for intervals. Hydration belt for my runs here in central Florida’s heat and humidity. Proper footwear (includes properly fitted shoes and good quality non-cotton socks. Assuming clothing is a given, I’ll go with properly fitted shoes, a good headband/cap, and a good pair earbuds! Only three?! That’s tough! I’ll go with the right shoes for him/her, a Garmin, and Body Glide. I’ve been running for a few years and never needed body glide. It’s for chafing, but I find that if I wear the right clothes, I have no issues with that. Well-fitted/right type running shoes, good headphones that won’t fall out (mine are Bose Sport), good sport’s bra, and CUTE running shorts. Okay- so that’s 4- I never claimed that math was my strength! A good well fitted pair of running shoes, an iPod/music of some sort with/headphones, and a Spi belt. Start with 1. great shoes….zero drop, minimal, go slow, get used to them, helps with proper form. (I love my Merrells) I can even run without socks 2. Body glide (for EVERYWHERE) 3. A good bra for the girls….if you don’t have ‘girls’ you can probably get away with the Body Glide! The best running shoes for THEIR FEET, shorts/skirt/capris with a pocket large enough to fit their phone/music device, snug fitting sunglasses to protect their eyes from sun/wind/debris. The right shoes, several good pairs of socks, and an anti-chaffing product like Aquaphor! Shoes, bra & phone/GPS – will show u progress & keep u hooked. Have someone watch your running gate. From a female standpoint: the right shoes, sports bra and moisture-wicking, fast-drying fabrics. This entry was posted in Question and Answers by Runners, Running Gear Review and tagged running gear. Why Running Isn’t Helping me to Lose Weight?